Very rugged construction for outdoor use on the fields of reenactment campaigns of the British Empire. 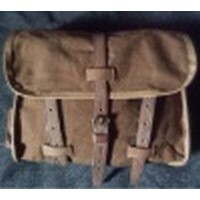 Multi use with internal dividers and longer carrying strap included, this is a worthy investment for any British Colonial Uniform. This was better than I expected and worth the cost. It has a few interior pockets to keep your gear separated - which they do not show in the pictures - along with an extra longer shoulder strap for you tall fellows!